Snapped in the Absolute Hotel Mall. I ROUTINELY ASK to be invited to meetings if they include an agenda because when they don't, I have to listen to people who want "air" time to pontificate. Lately, I've been trying to push meetings off into collaborative space where action items can be checked off when accomplished remotely. 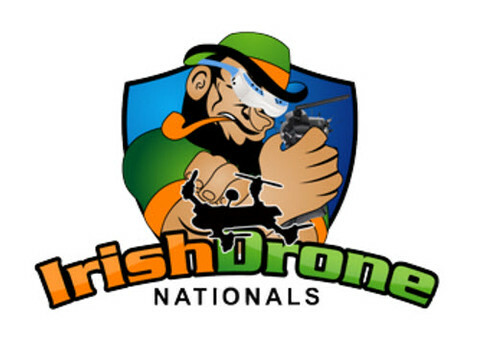 I FIRST HEARD of first person view (FPV) drone racing while listening to an episode of the Daily Tech News Show. Then I found YouTube videos about racing quadcopters through challenging terrain at improbable speeds. THE SUNDAY TIMES has a lovely article about the Irish animation industry today  and it caused me to think of the lovely work Cartoon Saloon has put into its artful productions. 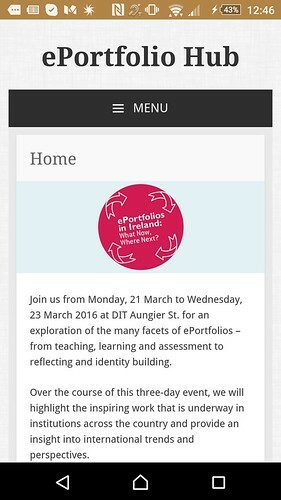 I ATTENDED THE THIRD DAY of the ePortfolio Conference in the Dublin Institute of Technology and finished with a renewed imperative to enhance my own ePortfolio and to advocate an option for portfolio reviews of applicants to our third level creative degrees. I SPENT THE AFTERNOON in a computer lab with teachers, lecturers and trainers during the third day of ePortfolioHub16. One of my happiest results came at the end of the day when I clicked into the co-authored Sway produced by those attending my workshop. BECAUSE OUR ENERGETIC daughter wants to share stories with friends, I showed her Pencil on my Android phone and she made a story. Then she tapped into the UsePencil site on the Surface Pro 2 and discovered it was much easier. I think we have a winning workflow here that starts with Mia snapping photos and screenshots of things she enjoys. Then she makes a little storyboard in a pocket-sized Moleskine where she tries to write captions for each image. And finally she creates a draft inside Pencil's easy-to-use platform. IT'S ST PATRICK'S DAY in Ireland but if you had the calendar used by my Stateside family, it's late. It seems most of the local Paddy's Day festivities in my former stomping grounds happened last weekend, which means when my Facebook images start bubbling up in newsfeeds today my closest family will think I'm having a senior moment. I'm listening to a stream of random audio clips on Anchor.fm from Americans who are trying to ascribe cultural significance to St Patrick's Day. To many people, you can distil the occasion down to green beer, shamrocks and leprechauns. After 20 years in Ireland, I've never had those three things on St Patrick's Day so I wonder if those three symbols represent mutt culture identity. In my own family history, I know my great-grandmother came from a small stone bungalow in County Clare. Four generations back, my family had survived the family in the west of Ireland, took hard-earned savings and made the journey across the Atlantic to settle in St Mary's Parish of Lancaster, Pennsylvania. That congregation was a mash-up of Irish and German, resulting in my grandparents marrying there. I dive into Ancestry.com and uncover tidbits of rural modesty that underscores my Irish and German peasant stock. If Marty McFly landed in our front garden to take me back to those boreens, I might feel uneasy during any conversation around the peat-burning hearth with my ancestors. To enhance my awareness of my roots, I'll attend several small town parades on St Patrick's Day. Nothing fancy and often very spontaneous activities. 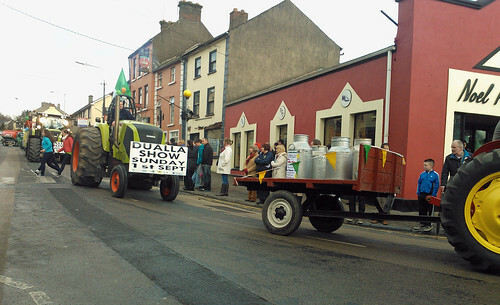 I won't be surprised if one of the parade floats runs out of petrol or if a hay bale on the back of a trailer catches fire or if a big placard falls off the front of an over-sized tractor and gets blackened by tyre tread marks. Because these are the authentic Paddy's Day events that precede friendly banter in the local pub when friends chat about how Paddy's Day was for them. And for you? Do you have family roots in original Paddy's Day celebrations? +++ Bernie Goldbach is a blow-in American living in County Tipperary, Ireland, with his family with a few photos of St. Patrick's Day in Ireland. 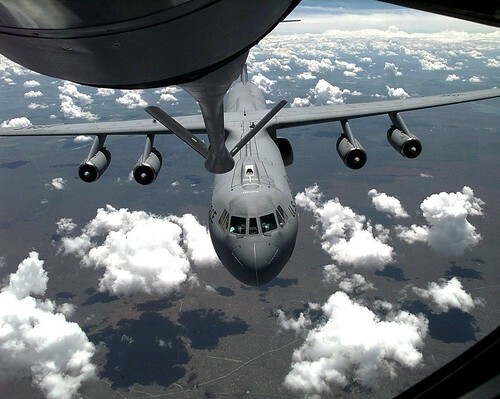 USAF Photo of C-141B air refueling in 1998. IN MARCH 1986, I often sat in the right seat of a large cargo jet and taught pilots in the left seat how to fly directly behind another large four engine jet. You had to practise the highly-engaging manual skills to do this workplace job right. 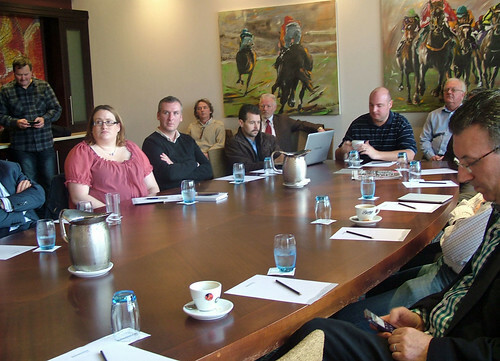 Some of those very sophisticated workplace skills had their foundation in flight simulation. All of them required documentation of what the pilots had learned and how their learning had progressed. The learning management system consisted of a series of forms held in manila folders. The written documentation rarely offered colour commentary of the white knuckle aerial refueling sessions. But you wanted to learn to do everything right and the air refueling sessions brought everything into sharp relief.